Animal Control say they gave this dog to you! When Maricopa County Animal Care & Control say that a dog went to "New Hope" they mean it was put into their New Hope Program and passed to one of the rescue organizations that are partners in this program. The New Hope Program is a partnership between MCACC and other animal welfare agencies to help ensure that as many adoptable animals as possible are placed into permanent and loving homes. New Hope partners take animals from MCACC that might otherwise have to be euthanized. Animals scheduled for euthanasia may be eligible for New Hope. Bite animals or aggressive animals (aggression to others dogs and aggression to humans) are not eligible for New Hope or adoption. 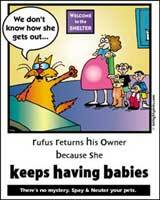 Depending upon the circumstances, exceptions may be made by the Shelter Manager based on the results of an evaluation. Click here for more information. It is because of the New Hope Program partners that so many animals are saved from destruction. Many of these groups are small, volunteer based organisations that rely on donations to continue rescuing animals. Every dog and cat that is adopted from these organisations releases a space that can be used to rescue another animal from Maricopa County Animal Care & Control. 101 N 55th St Phoenix AZ 85034. PO Box 7313, Surprise, AZ 85374-7313. 1102 West Hatcher, Phoenix, AZ 85021. PO Box 39175, Phoenix, AZ 85069. P.O. Box 27686, Prescott Valley, AZ 86312. P.O. Box 74124, Phoenix, Arizona, 85087.